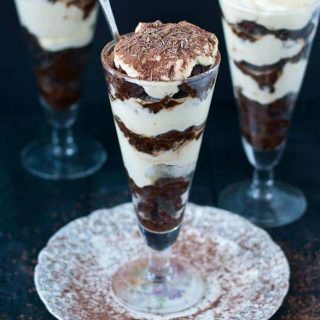 Layers of coffee and rum soaked brownie and fluffy mascarpone filling make up these irresistible, luxurious Tiramisu Brownie Parfaits. Warning: along with my favorite dessert of all time, this post also contains lots of schmaltz and sentiment and maybe even a kissing photo. Don’t tell me I didn’t warn you. Two weekends ago we celebrated the Mr.’s birthday like most normal adults do–by going to an indoor water park and spending the day riding water slides, chilling in the lazy river, and squirting small children with spray guns. While it might not be a conventional choice, it’s one of the things I love most about the Mr. He’s not afraid to let his inner child out. I know left to my own devices I would become a rather boring adult. Caught up in mortgages, bills, and Responsiblity, I’d likely spend my evenings watching Wheel of Fortune, reading the paper, then turning in at 8 PM. But with the Mr. around, I know life will never be boring. We may grow old together, but I know with him by my side, I’ll always feel young at heart. Today I want to take some time to celebrate this guy. My guy. The guy who has supported this crazy blogging endeavor from day 1. The guy who has put up with late nights and tripping over tripods and piles of dirty dishes. The guy who has encouraged me to take risks, pursue what I love, and get better every single day. 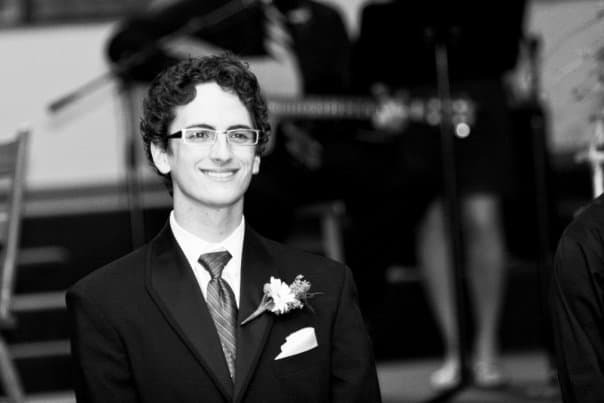 This is the man who asks for Legos for Christmas. The one who works hard every day to provide for our family. The one who has seen multiple house renovations through to their (painfully long, expensive) end. 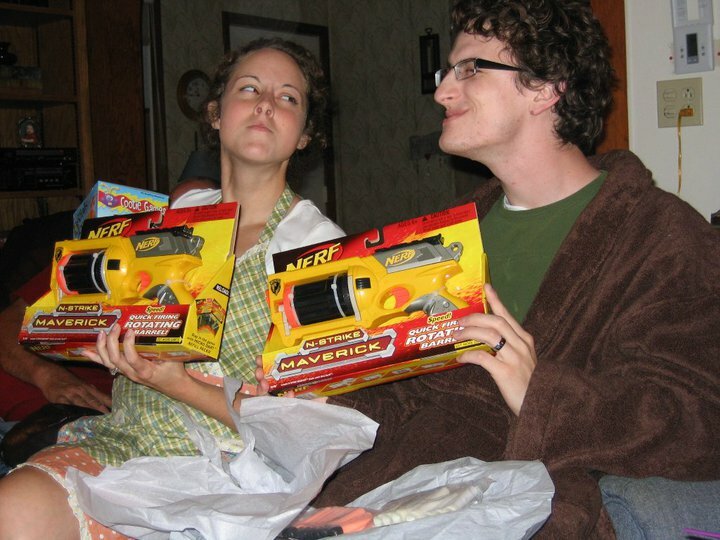 The one who put Nerf guns on our wedding registry. 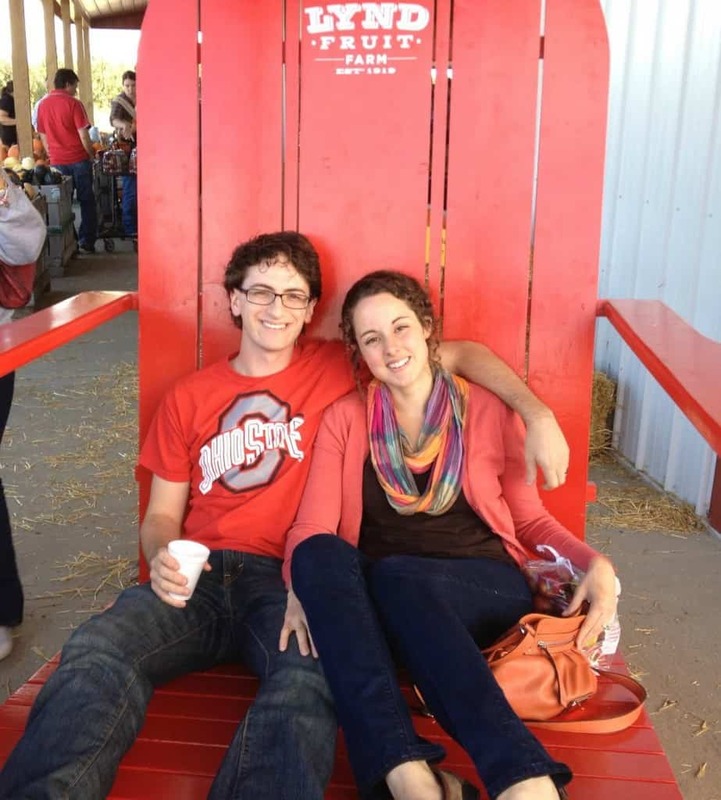 The one who cheers for the Buckeyes and sits in big chairs for our annual Fruit Farm Photo. 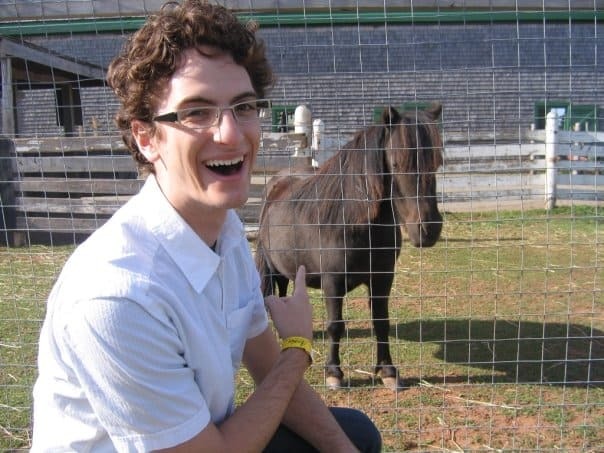 The one who loves mini horses. 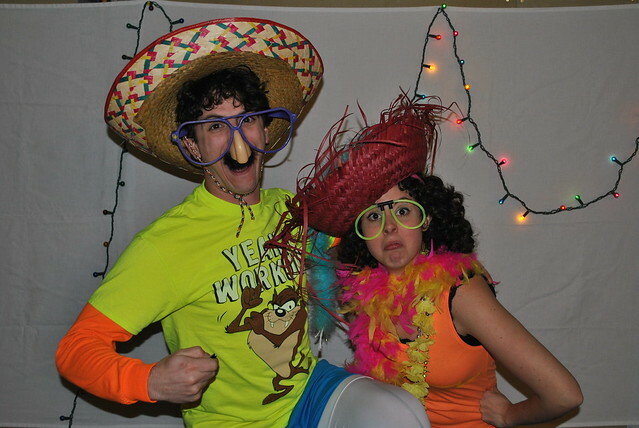 The one who knows one doesn’t simply “go to a neon party.” You OWN the neon party. The one who I can’t wait to grow young with. The one who loves tiramisu and brownies. When I was deciding what to make for the Mr. I immediately settled on tiramisu. But then I remembered his affection for dark, chewy, fudgy brownies, and suddenly the choice became clear. 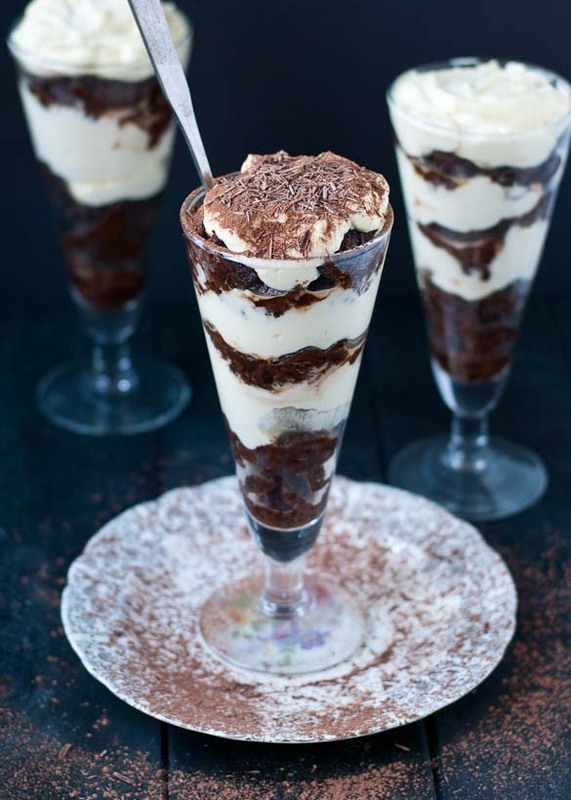 I needed to combine his two favorites into one epic Tiramisu Brownie Parfait. Guys, this might be THE BEST DESSERT I’VE EVER MADE. Yes, the capitals were necessary. I estimate I probably have around 100 dessert recipes on this blog. And I’m a big fan of all of them. But these were crazy good. Like, stop you in your tracks good. Like, can’t stop eating them good. Like, hold the phone, stop drop and roll, I-discovered-the-meaning-of-life good. Coffee soaked brownie sandwiched by layers of fluffy, creamy mascarpone filling. It’s cake meets pudding meets heaven….in a glass. It turned out to be much easier to make than I anticipated and the combination is incredible. 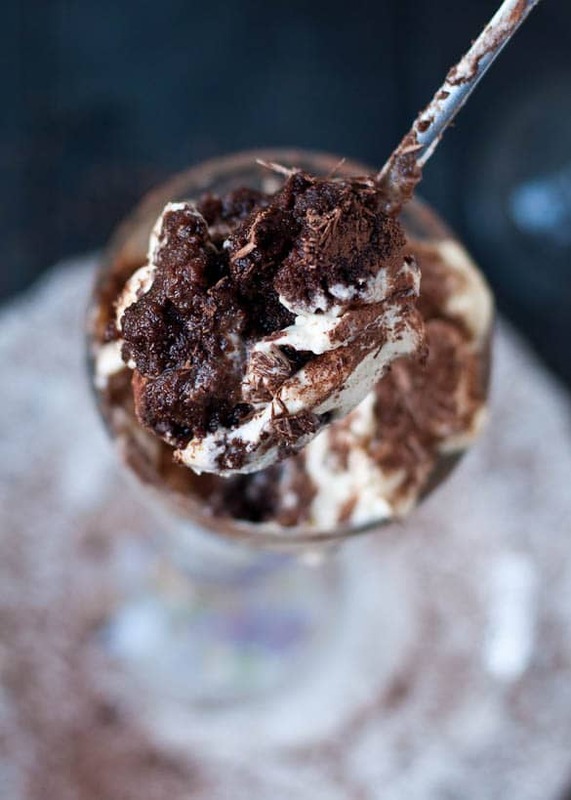 As it sits the brownie and filling become one rich, decadent layer of chocolate espresso cream. I want to sleep on clouds of that mascarpone filling. I’ve included some step by step instructions and photos below the recipe to make it super easy to follow. Because I don’t want there to be any excuse for you not to make these. Seriously, go do it. Readyyyyyy….? NOW! Follow the instructions on the back of your brownie mix for mixing your brownie together. Replace all the water with rum and add espresso powder. Bake the brownies in a greased 9 x 13 inch pan according to package directions. Remove and allow to cool. 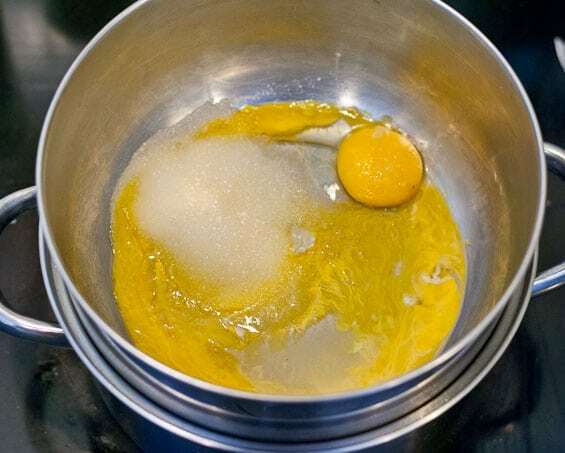 Combine egg yolks, rum, and sugar in a double boiler (or heat proof bowl set inside a pot of simmering water). Cook, whisking constantly, until egg mixture is smooth and turns a pale yellow color. This will take about 5-7 minutes. Remove from heat. Stir in mascarpone cheese. 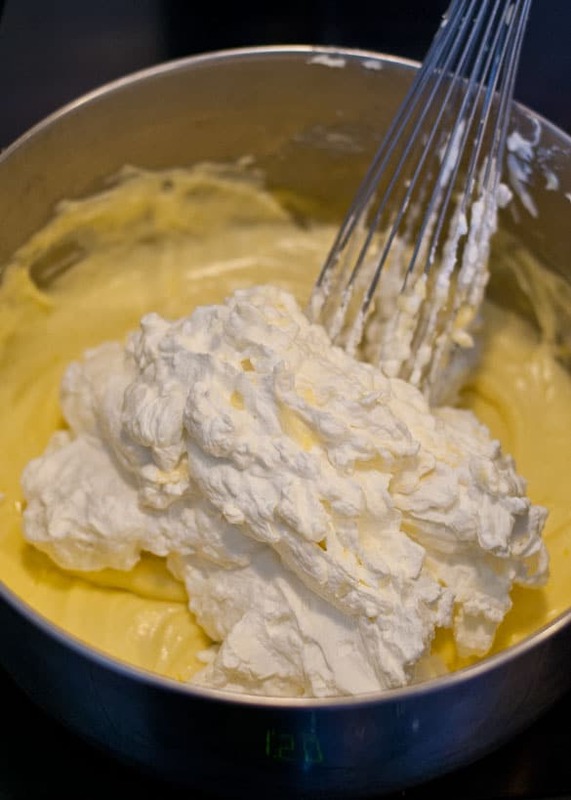 In the bowl of an electric mixer or other large mixing bowl, beat cream until soft peaks form. Stir cream into the mascarpone mixture. The mixture will deflate a little bit. Whisk together the coffee and rum in a deep bowl. Break the brownie up into bite sized pieces. Dip the brownie into the coffee mixture for just a second or two then place it in a cup or bowl of your choice. Follow that with a good scoop of the mascarpone mixture followed by more brownie. 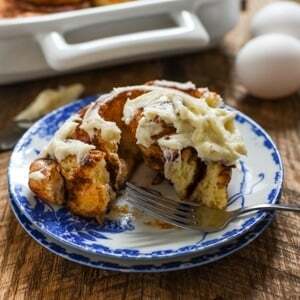 Repeat, ending with a layer of cream. Dust the tops of the parfaits with cocoa powder and chocolate shavings, if desired. Serve immediately or chill until ready to serve. This recipe starts with a box brownie mix, because hello?! EASY. I replaced the water with rum and added a teaspoon of espresso powder. Other than that, you just follow the instructions on your brownie mix. Usually something like dump, stir, pour, bake. Super simple! While the brownie is cooking you can whip up the filling which is made of egg yolks, sugar, mascarpone, and whipped cream. Start by placing the egg yolks, sugar, and rum in a double boiler or heat proof bowl that fits over a simmering pot of water. 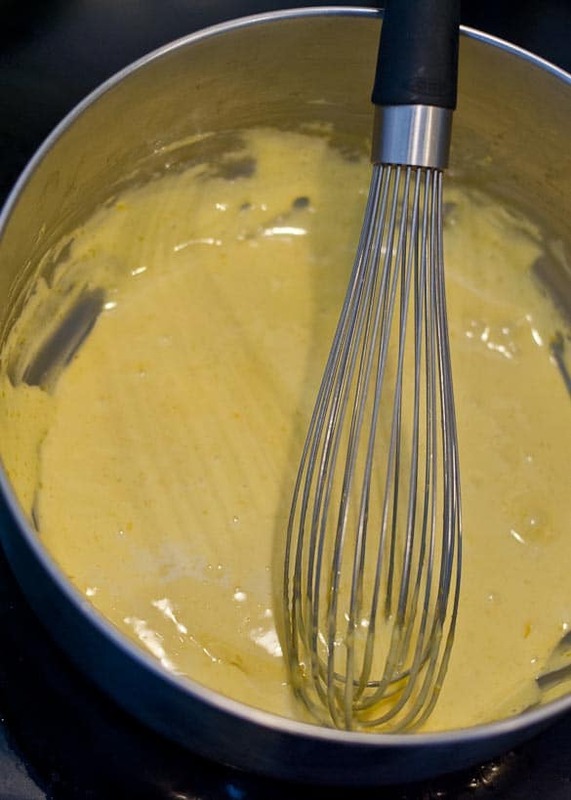 Whisk together the yolks, sugar, and rum, and allow it to cook, whisking constantly, until it becomes smooth, creamy, and a pale yellow color. Remove the egg mixture from heat and stir in the mascarpone cheese. Meanwhile, whip your whipped cream. 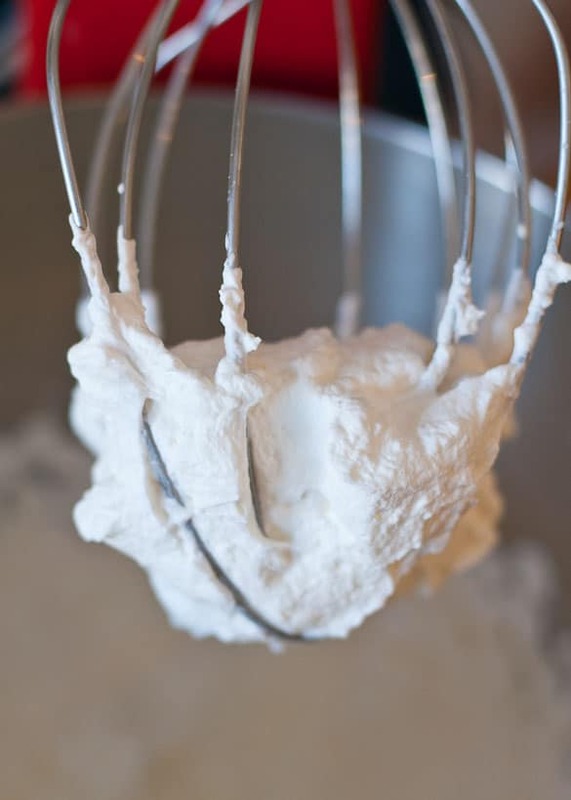 Place the cream in a clean, cool bowl and beat it using electric beaters or the whisk attachment of a stand mixer. I usually start the mixer on medium speed and once the cream is thickened enough not to splatter, I’ll crank it to high. Beat until the cream is thick. It should hold it’s shape and cling to the beater. 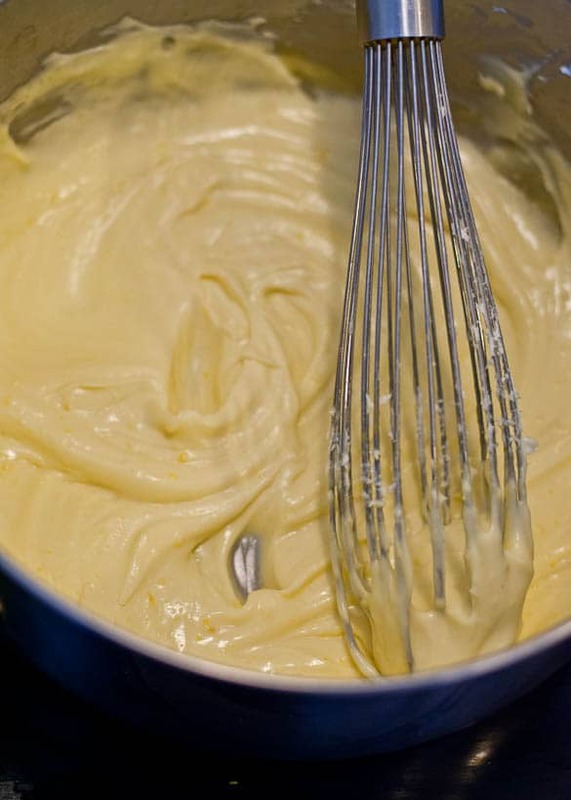 Whisk the cream into the mascarpone/egg yolk mixture. The cream will likely deflate a little. Don’t worry about it. From there, it’s all just assembly. Whisk together a cup of coffee and a few Tablespoons of rum. Break the cooled brownies into small chunks, dip them in the coffee rum mixture for just a second or two, then place them in the bottom of a glass. 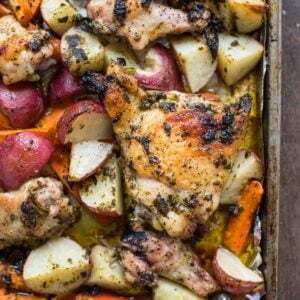 (You can also feel free to assemble this in one 9 x 9 inch square pan. Follow that up with some of the cream filling. Add more brownies, then more cream. And repeat one more time. Finish with a sprinkling of cocoa powder and chocolate shavings. Devour in excess. Repeat. Can you two be any cuter? Happy birthday Mr. Neighborfood! Also I really want to go to an indoor water park! Giiiirrrrrrl, for the love of all that is good and holy in the world, this is amazeballs. F’real. I love it. Dark fudgy brownies soaked in coffee and rum and layered with creamy, dreamy mascarpone filling?! Stop drop ‘n roll indeed! I want to stop drop ‘n roll in a giant tub of this. 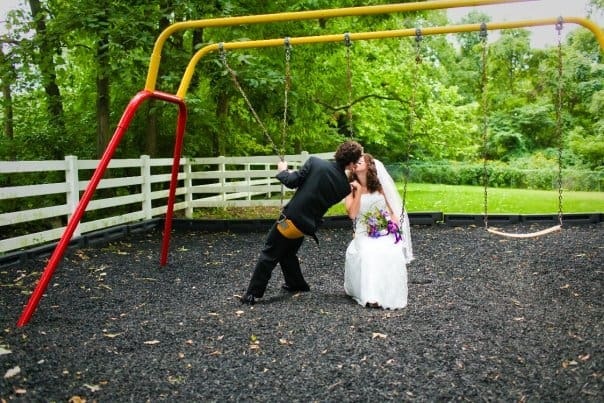 I love all the photos of you and the Mr. You guys are adorable! Again, you and I are the same person because it sounds like we picked very similar husbands. If it weren’t for my hubs, I’d be an old lady who does nothing but work, come home, clean and then go to bed. He keeps me young, he always wants to try new things and yes, he’s the one who took care of AAAAAAALLLLL the renos we’ve been doing these past three months because he wanted to spare me the headache. Our husbands are the best! And you’re the best for dreaming this up and making it. You guys are adorable! I love that you went to the water park…freaking awesome. 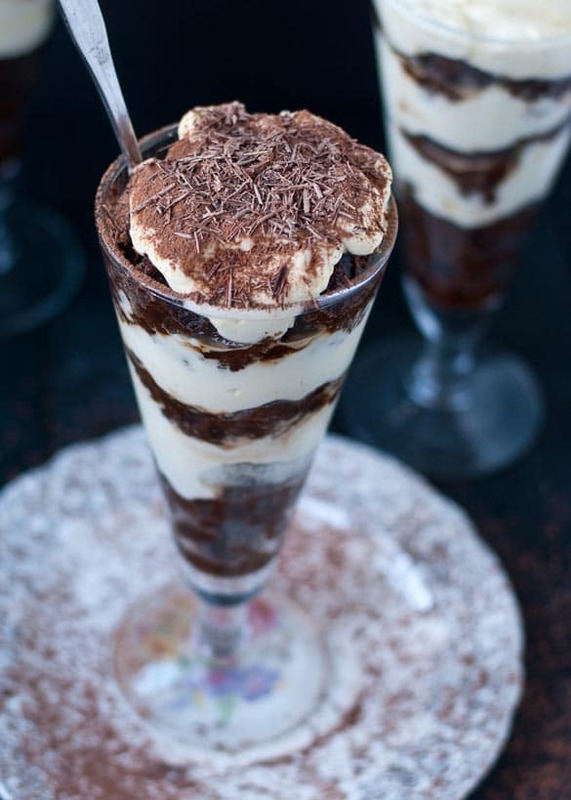 Tiramisu and brownies are my favorite, so I definitely want to eat this. You would LOVE it Lauren! Seriously the best of both worlds. Awww SWEETEST POST EVER!! Happy birthday to the Mr.!! I love that you guys celebrated in such an unconventional but still awesome way. 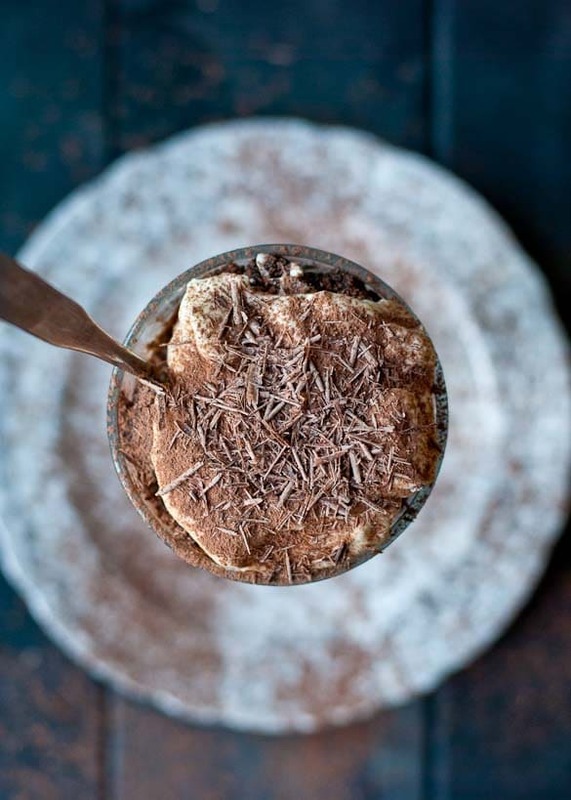 And these tiramisu parfaits – swooning. Thanks Joanne! We had such a great time. It’s so great to feel like a kid now and then. You guys are so sweet! And I love these little desserts, amazing! Thanks so much! They’re a new favorite. Yours is a match made in heaven. But this dish sounds absolutely sinful! Hope he enjoyed it. This is so cute. You remind me of my daughter and her boyfriend. Date night consists of playing zombies vs humans at the U. They buy each other comic books and nerf guns as gifts. It’s so cute. Love the desserts. I’m a parfait fanatic. Thanks Kim! You are the queen of parfaits!! I love that Liz! How sweet that he reads your tweets. I know you will both love this! It’s so good!